Fractures of the odontoid process of the axis are the most common fractures of the geriatric cervical spine. As the population ages, their incidence is expected to increase progressively, as is the number of very old patients (>80 years) with an odontoid fracture. No consensus exists on the optimal treatment (surgical or conservative) and the most relevant outcome parameter (osseous union, fracture stability or clinical outcome). The aim of the INNOVATE (INterNational study on Odontoid frActure Treatment in the Elderly) Trial is to prospectively assess fracture healing and clinical outcome after surgical and conservative treatment for odontoid fractures in the elderly patient, with a specific focus on the very old patient. The trial is an observational study in which eleven centres in five European countries are involved. All patients admitted to one of these centres who meet the selection criteria (≥55 years, acute (<two weeks) type II/III odontoid fracture, no rheumatoid arthritis, no ankylosing spondylitis, no previous treatment for odontoid fracture) are asked to participate. The applied treatment is in accordance with usual care and chosen by the treating surgeon and patient. A cohort of 275 patients will be included. Clinical and radiological follow-up moments are scheduled at 6, 12, 26, 52 and 104 weeks, at which both surgeon and patient will complete Case Record Forms (CRFs). The primary outcome will be a combination of fracture healing and clinical outcome at 52 weeks. Osseous union and fracture stability will be assessed with CT-imaging and dynamic X-ray. Clinical outcome will be scored by the Neck Disability Index (NDI) and correlated to the imaging data. Additionally, predefined subgroup analysis will be carried out (i.e. for patient age and osteoporosis) and prognostic factors will be identified. Evidence for the optimal treatment for odontoid fractures is lacking. Focusing on both fracture healing and clinical outcome, the results of this study will yield valuable information enabling more rational decision making in the treatment for odontoid fractures in the elderly. In the elderly, odontoid fractures are the most common fractures of the cervical spine [1–6]. As the population ages, their incidence and relevance to clinical practice are expected to increase . The treatment for patients with fractures of the odontoid process is based on the fracture pattern, the patient’s medical condition  including age, pain, neurological deficits, and the surgeon’s personal preference. Surgical treatment involves anterior odontoid screw fixation or posterior (cranio)atlanto-axial arthrodesis, leading to prompt stability of the upper cervical spine. However, the condition of the patient may deteriorate by undergoing (major) cervical spine surgery . Especially in the very old (≥80 years of age), a surgical intervention has significant risks for the patient. An alternative to avoid the possible complications of cervical spine surgery is conservative treatment with rigid or non-rigid immobilisation for a longer period of time. However, such immobilisation may eventually result in non-union and prolonged fracture instability, requiring secondary surgery . This unnecessarily lengthens treatment duration and, worse, can cause significant deterioration of the cervical spine anatomy and the patient’s condition . Finding the right balance between fracture healing and treatment complications is difficult. In very old patients, finding this balance is even more challenging. In hospitals where upper cervical spine surgery is frequently performed, it is becoming increasingly common to operate on even the very old patient with a cervical spine fracture. However, debate remains as to whether or not this is indeed a favourable development. Currently available literature reviews on this topic were inconclusive [11, 12]. Recent clinical studies focussed on survival and the occurrence of complications, but not on fracture union and stability [13, 14]. All other performed clinical studies were carried out retrospectively, were of limited quality and most did not specifically focus on elderly patients. Moreover, minimal attention was paid to grounds for chosen treatments, and patient groups were often poorly comparable. In the vast majority of published studies, only a small number of patients were included (typically <50). Furthermore, the goal of treatment is still debatable. It is unknown whether or not non-union always leads to complaints in the patient. Consequently, debate remains as to whether the goal of treatment should be osseous union, fracture stability or a favourable clinical outcome. The measurement of these parameters is likewise not uniformly described. The available literature shows higher osseous union rates in surgically compared to conservatively treated patients (66–85% and 28–44%, respectively), but patient selection mechanisms may have profoundly interfered with these outcome percentages. The majority of patients achieved fracture stability regardless of the applied treatment (82-97% in surgically treated patients and 53-79% in conservatively treated patients). There are insufficient data available, especially from direct comparisons, to determine the difference in clinical outcome between surgical and conservative treatment strategies. There is no evidence that clinical outcome correlates better to fracture union than to fracture stability, or that the quality of union, whether it be osseous of fibrous, influences clinical outcome . The goal of this study is to prospectively compare fracture union, fracture stability and NDI improvement at 52 weeks between surgical and conservative treatments in patients over 55 years of age with acute type II and III odontoid fractures. Predefined subgroup analysis may offer prognostic factors that can predict the success of either a surgical or conservative treatment. The influence of age (≥55-80 and ≥80 years) on treatment outcome will particularly be studied. The outcome of this study will yield valuable information enabling more rational decision making in treating the elderly patient population. The INNOVATE (INterNational study on Odontoid frActure Treatment in the Elderly) Trial is a prospective, comparative cohort study with two parallel groups. A multi-centre study is necessary to include the required number of patients in a favourable time frame and to obtain generalisable results. The trial will be conducted in eleven hospitals in five European countries (Table 1). Medical ethical approval was obtained in all participating centres prior to the start of the study. In a number of other hospitals, the trial is still pending approval after which these centres will also participate. The participating centres are individually responsible for the treatment applied. The coordination of the study will be carried out by the Spine Intervention Prognostic Study (SIPS) Group of the Leiden University Medical Centre. Experienced in conducting multi-centre national and international studies, the SIPS Group has established research databases and has a group of research nurses available. The research nurses will monitor data collection and can be consulted by surgeons and patients who have questions about the study protocol or the treatment of individual subjects. The main research question will be answered at 52 weeks of follow-up. The complete follow-up period will be 104 weeks (Figure 1). Flow chart of the INNOVATE Trial. *In these countries, no medical ethical approval is required for observational studies. All patients admitted to one of the participating centres who meet the selection criteria will be asked to participate in the study (Table 2). Prior to the start of treatment, the patient will be enrolled by notification to the SIPS Group. The inclusion of patients will continue until the target sample size is reached. During baseline and follow-up appointments, radiological and clinical data will be gathered. Patients will also be sent questionnaires to answer at home. Questionnaires will focus on pain intensity, general wellbeing, perceived recovery and illness-related inconveniences. The treating surgeon and patient will make a shared decision as to whether surgical or conservative treatment will be applied. Participating centres and surgeons are all able to facilitate and respectively carry out both surgical and conservative treatments. Surgical treatment can be carried out by either an anterior or posterior approach. In an anterior approach, a single or double odontoid screw is inserted through the corpus of C2 into the odontoid process to directly stabilise the fracture (anterior odontoid screw fixation). In the posterior approach, fixation of the C1-C2 vertebrae is carried out, thereby indirectly immobilising the odontoid process as well (C1-C2 arthrodesis). The posterior technique is sometimes extended cranially to C0 or caudally to C3 or lower, possibly leading to increased stability but further limiting the cervical range of motion. A CRF will register the procedures/findings of the surgeon and the motivation for the chosen surgical treatment strategy. Conservative treatment involves a variety of devices by which a patient’s cervical spinal column is rigidly or non-rigidly externally immobilised. Rigid immobilisation is mostly carried out by application of halo-vest traction. Non-rigid immobilisation is achieved by application of a hard cervical collar (e.g. Philadelphia or Miami-J collar). A CRF will register the procedure and motivation for the chosen conservative treatment strategy. 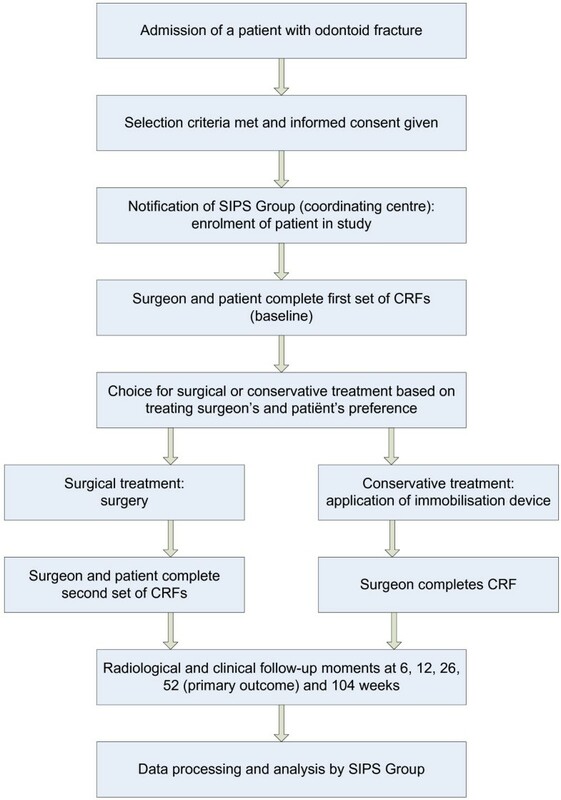 After inclusion and prior to the start of treatment, both surgeon and patient will complete the first set of CRFs. In the case of a surgical treatment, the surgeon will complete a CRF directly after surgery and the patient will complete a second set of CRFs three days after surgery to assess the short-term effect of the operation for the patient. In the case of a conservative treatment, the surgeon will complete a CRF after the application of the immobilisation device. Patients will be seen by the treating surgeon five times for radiological and/or clinical follow-up visits; at 6, 12, 26, 52 and 104 weeks after the start of treatment. In addition to usual patient care, patients will be sent questionnaires (CRFs) to complete at home prior to each follow-up visit (Table 3). On no occasion will patients see the results of earlier assessments. After the last follow-up visit at 104 weeks the patient’s participation in the study ends. *In case of surgical treatment only. Fracture healing will be scored by assessing union (union or non-union) and stability (stable or unstable). o Union will be defined by evidence of bone trabeculae crossing the fracture site and absence of sclerotic borders adjacent to the fracture site, assessed using computed tomography (CT). o Fracture stability will be assessed using upright cervical dynamic X-rays in lateral projection. A maximum of 2 mm movement at the fracture site is considered stable, over 2 mm movement at the fracture site is considered unstable . Clinical outcome; scored by calculation of the improvement compared to baseline in the Neck Disability Index (NDI)  score at 52 weeks after start of treatment. The NDI is a widely applied instrument to assess neck pain complaints. It was derived from the Oswestry index for back pain and the Pain Disability Index. In the sample size calculation, the significance level was adjusted for the multiple primary outcome measures. Secondary clinical outcome parameters will be assessed by questionnaires to be completed by the patient. At baseline they will be completed at the hospital. During the follow-up period, they will be sent to the patient’s home. Radiological outcome parameters will be assessed by questionnaires to be completed by the treating surgeon and, in addition, again at the coordinating centre. Myelopathy Disability Index (MDI) : The MDI is a functional scoring system for cervical myelopathy that was originally designed for patients with rheumatoid arthritis. It consists of a selection of questions from the Standford Health Assessment Questionnaire. Visual Analogue Scale (VAS) for neck pain [18, 19]: The VAS neck pain score indicates the intensity of experienced neck pain by drawing a mark on a 100 mm line. 0 mm symbolises ‘no pain’ , 100 mm symbolises ‘pain as worse as it could possibly be’. Short Form-36 (SF-36) [20, 21]: The SF-36 is a generic health survey consisting of 36 questions. It consists of eight domains: physical functioning, physical restrictions, emotional restrictions, social functioning, somatic pain, general mental health, vitality and general health perception. It results in physical and mental health summary measures and a health utility index. EuroQol 5 Dimensions (EQ-5D) : The EQ-5D is a tool to measure health outcome. It yields a descriptive profile and single index value for the patient’s health status. Type D Scale 14 (DS14) : The DS14 is a standard assessment of negative affectivity, social inhibition, and Type D personality. Illness Perception Questionnaire-K (IPQ-K) : The IPQ-K is a brief illness perception questionnaire, using a nine-item scale to rapidly assess the cognitive and emotional representations of the patient’s illness. Likert scale on recovery: The Likert scale used for this study is a seven-point scale on the patient’s perceived recovery from complaints and neck pain. Not all of these questionnaires were already validated in the native languages of all countries involved in this trial. Therefore, prior to the start of the study they were validated by a process of bilateral translation. A native speaker of the target language who was also fluent in English first translated the questionnaire into the target language. A native speaker of English who also spoke the target language and was blinded to the original text then translated the text back into English. The original text and the back translated text were then compared at a consensus meeting. If the meaning of the two texts was agreed to be identical, the question was assumed to be adequately translated. Possible differences were discussed. More extensive options for transcultural adaptation of questionnaires were not considered feasible or necessary in the context of this trial. Fracture displacement and direction: Displacement will be assessed by drawing lines along the posterior and lateral aspects of the odontoid process and the caudal body of C2. Displacement is expressed in mm. Direction is categorised as anterior, posterior, lateral, anterior-lateral or posterior-lateral. o None: normal trabecular pattern with normal cortical thickness. o Mild: decrease in the amount of trabeculae with no areas of holes and normal cortical thickness. o Moderate: absent trabeculae (holes) involving less than 25% of the transverse diameter of the bone with cortical thinning. o Severe: absent trabeculae (holes) involving more than 50% of the transverse diameter of the bone with cortical thinning. o None: normal joint space with no osteophyte formation. o Mild: narrowed joint space or normal joint space with osteophyte formation. o Moderate: obliterated joint space with or without osteophyte formation. o Severe: completely obliterated joint space, ankylosis or fusion of the joint. Complications: Complications resulting from the application of the different treatments will be monitored to identify potential differences in the occurrence or severity of complications between treatments. Re-interventions/Secondary surgery: One of the goals of the conservative treatment policy is to avoid surgery while still achieving fracture healing and a favourable clinical outcome. The rate of secondary surgery is hence an indication of the success or failure of this policy. Secondary interventions and the cause/motivation for its application will therefore be monitored. Based on the recent literature review, the estimated possible difference in fracture union between the groups is 41% and in fracture stability this difference is 21% . For both union and stability, however, a smaller difference of 20% would be clinically relevant and the study is powered to assess this difference. For the NDI, a 7.5 point difference (on a 50 point scale) is generally accepted as a minimal clinically important difference with a SD of approximately 10 in various psychometric studies [26–29]. Furthermore, it is expected that the number of patients that will be treated surgically will be twice the number of patients that are treated conservatively (2:1) . Since three primary outcome hypotheses will be tested, the significance level (α) has to be divided by three. Based on the primary outcome parameters, the required sample size, assuming α = 0.05/3 = 0.0167 (two-sided) and β = 0.20 (80% power) and an expected drop out rate of 10%, is 275 for union, 198 for stability and 93 for the NDI. In conclusion, 275 patients will need to be recruited in order to give a reliable conclusion to the comparison of union, stability and clinical outcome between the surgically and conservatively treated groups. Mean, median and standard deviations or median and ranges, if appropriate in case of skewed distributions, of descriptive parameters of primary and secondary outcomes will be reported. Univariate analysis will be carried out using χ2-tests for dichotomised outcomes and T-tests for continuous outcomes. Intention-to-treat analysis will be used for cases that crossed over to other interventions. The χ2-test will be used to test for differences between groups on union and stability at 52 weeks (α = 0.0167). T-test will be used to test for differences between groups on NDI improvement at 52 weeks (α = 0.0167). The χ2-test will be used to analyse the difference in dichotomised NDI. NDI will be dichotomised using the criterium of the minimal clinically important change (improvement) of 7.5 points out of 50. The relation between radiological parameters (union and stability) and NDI will be analysed by comparing the average NDI improvement for patients that acquired union/stability with those that did not. Subjects can leave the study at any time for any reason if they wish to do so without consequences. As this is an observational study, this will only have influence on the study related assessments. Individual subjects withdrawn from the study will not be replaced. In the sample size a dropout rate of 10% was calculated for. Data analysis will be carried out based on the intention-to-treat principle. Cross-over-cases (e.g. surgery after failed conservative treatment) will be analysed among the original treatment group. This will not cause methodological problems because it is two healthcare strategies that are being compared, as opposed to two specific treatments. The reasons for cross-over of patients will be studied and reported. Causes of death will be analysed and a potential relation to the diagnosis and the applied treatment will be studied. As-treated analysis will additionally be carried out in a sensitivity analysis and prognostic factors for the likeliness of surgery after failed conservative treatment will be studied. In this article the rationale and design of a prospective cohort study on surgical versus conservative treatment for odontoid fractures in the elderly is described. There is a lacuna in evidence-based knowledge and guidelines in treating this patient population. To the authors’ knowledge, only one prospective study on this subject has yet been published, involving 159 patients ≥65 years with type II fractures but focusing just on characteristics associated with treatment success or failure and not on describing fracture healing . However, the INNOVATE Trial will specifically aim to evaluate the outcome separately for patients younger and older than 80 years. Moreover, not only fracture union, but also fracture stability will be evaluated in the INNOVATE trial, which will be correlated to clinical outcome. A combination of (relative) fracture stability and favourable clinical outcome might be a legitimate endpoint of treatment in elderly patients, although long term effects have to be investigated. The objective of this trial is to identify which treatment strategy is most favourable for elderly patients with acute type II and III odontoid fractures and to identify factors that predict the success of either one of the available treatment in individual patients. The results of this trial will yield valuable information enabling more rational decision making in the treatment of odontoid fracture in elderly patients. The INNOVATE Trial is sponsored by a EuroSpine start-up grant. JH is the project coordinator. WJ is responsible for the sample size calculation and design of the analysis. WP is the head of department and trial advisor. CV is the principal investigator and initiator. All authors contributed to the trial design and are responsible for the protocol. All authors read and approved the final manuscript.